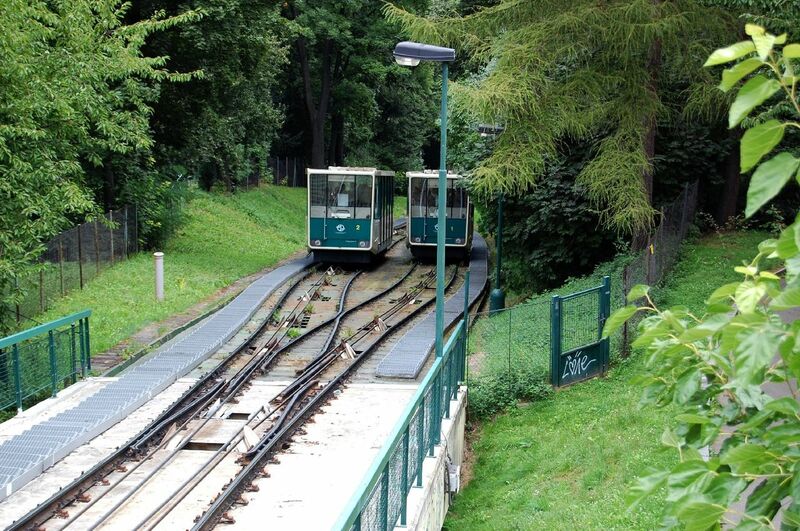 An excellent alternative to public transport in Prague for travelling from point A to point B is using the funicular railway. This option provides fun and leisure, especially during warm and beautiful weather as well as offers you spectacular views. The funicular way in Prague runs from the Lesser Town district up to the top of the amazing Petrin Hill. 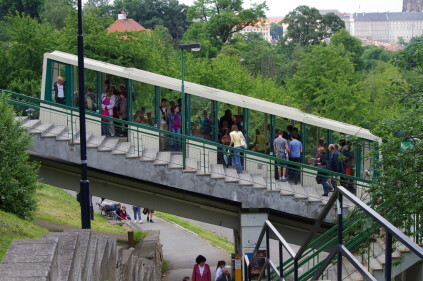 It services the Ujezd – Nebozizek – Petrin route and since it forms part of the Prague public transport network, a ticket for travel on trams, buses and the metro is also valid on the funicular. The funicular stops half way up at Nebozizek for passengers to get off and perhaps visit the nearby restaurant which offers an amazing view of Prague. There is a park and wooded area on the one side of Petrin Hill as well as the landscaped gardens, the Petrin Observation Tower, a mirror maze and an observatory. The funicular is located at Ujezd, which is a 10-15 minutes away from Charles Bridge or from the National Theater in the other direction. The funicular was opened on 25th July 1891 and ceased running in 1916 due to World War I. It started operating again in 1932. The railway passes through the Hunger Wall which was commissioned by Emperor Charles IV in 1360-1362. The wall gained its name in memory of the fact that it was built to provide employment for residents of Prague during hard times. It formed part of the city’s original medieval fortifications. The funicular operates daily from 9 a.m. to 11.30 p.m. (from April to October) and from 9 a.m. to 11.20 p.m. (From November to March) with 10-50 minute intervals. There is also a chairlift in the Prague Zoo which was put up in service in 1977. The operator of the chairlift became the Prague Public Transport Company. The fare is 20 CZK for a single journey for passengers older than 6 years. It offers an amazing view of not only the Prague Zoo, but also the surrounding area. Comments to "The funicular railway in Prague"